The Range Regional Airport (HIB) is served by SkyWest Airlines operating as Delta Connection providing daily jet service utilizing a CRJ-200 (50 seats) Canadair Regional Jet to Minneapolis-St. Paul International Airport. Compare flight costs and book tickets at www.delta.com or calling 1-800-221-1212. Choosing to fly local rewards you with cost savings and convenience. When booking your next trip, utilize the Flight Calculator to compare your total trip costs considering tickets, driving expenses, parking fees, etc. Your time is worth money! 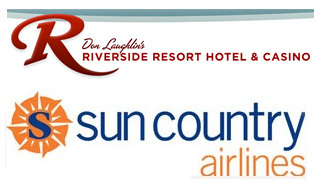 The Riverside Resort and Casino provides direct charter flights from the Range Regional Airport to sunny Laughlin, NV. These flights occur approximately every 4-6 weeks and are provided on Sun Country Airlines utilizing a Boeing 737-800 (162 seats). Flight schedules may be viewed at the Riverside Resort and Casino’s website at http://www.riversideresort.com/flights-map.aspx?id=217.